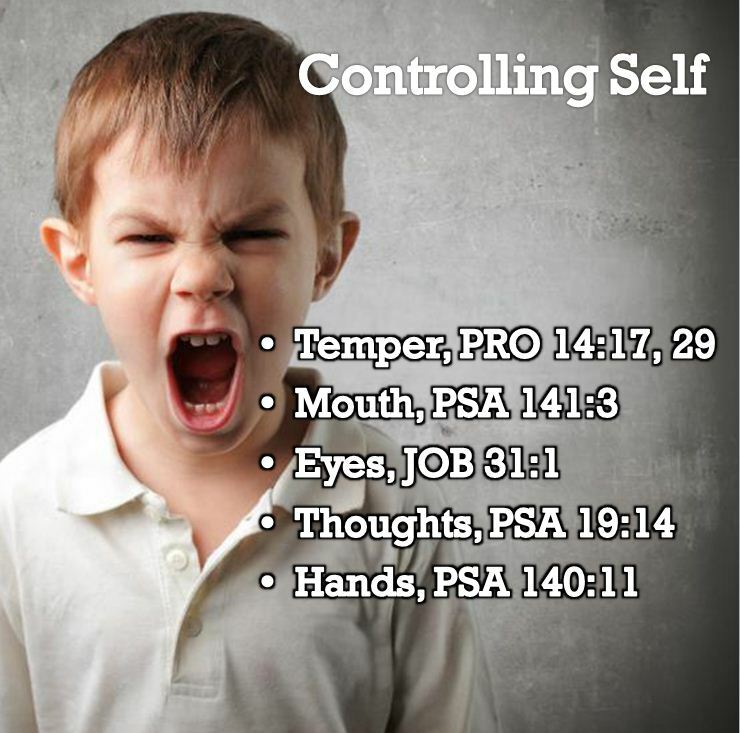 To end my series on The Fruit of the Spirit, self-control is the last on the list but certainly not least! We will never control some things. We cannot stop the tides from going in or out. As much as some would like, we cannot control the weather so that it will not rain on our parade. We must admit that there is far more over which we exercise no control than that which we do. God does not require that we try to control what is beyond us or that we fret because they are beyond us. Some things in life we must learn to accept peacefully, yield to and work our way through. Otherwise, we could find ourselves “beating our heads against a wall” and driving ourselves into the psychological imbalance of always seeing ourselves as victims. It is sometimes surprising how little control we have over other people—even in our families, our own flesh-and-blood children we have reared from birth. Parents are often shocked by their children’s behavior, especially of their teenagers, whom they thought they had trained well. Many parents have discovered that merely telling their children what they can or cannot do—accompanied by warnings of dire punishment—is not enough to control their behavior when the children find themselves under the pressure of a situation. Perhaps the supreme irony is when we realize how little control we exercise over ourselves. We find ourselves enslaved, even addicted, to habits created and engraved on our character over years of practice. This discovery can be a devastating, humbling blow to the ego. It often occurs after an intense study of Almighty God’s standard of thinking, speaking and behaving in contrast to the fashion of the world we have willingly and, in many cases, thoughtlessly followed. Once, there was no fear of God before our eyes, but when He begins to come into focus in our mind’s eye, and we care what He thinks about us, then we begin to be concerned about controlling ourselves. And how does the Spirit produce this fruit of self-control in us? By instructing us in the superior preciousness of grace, and enabling us to see and savor (that is, “trust”) all that God is for us in Jesus. “The grace of God has appeared . . . instructing us to deny . . . worldly desires . . . in the present age” (Titus 2:11–12). When we really see and believe what God is for us by grace through Jesus Christ, the power of wrong desires is broken. Therefore the fight for self-control is a fight of faith. “Fight the good fight of faith; take hold of the eternal life to which you were called” (1 Timothy 6:12). In this life, no one achieves all the fruit of the Spirit equally. Some speculate that Paul might have lost control of his temper when he had a “sharp disagreement” with Barnabas over whether to invite John Mark to join them for another missionary journey (Acts 15:36–41). In regard to gaining perfection in this life, he wrote to the Philippian believers, “Not that I have already obtained all this, or have already been made perfect, but I press on to take hold of that for which Christ Jesus took hold of me” (Philippians 3:12). The Spirit of Christ who works in our hearts to help us live above sinful practices, as well as the offering of loving counsel by Christian brothers and sisters, enables the fruit of self-control to grow for the glory of God. As a result, we can model God’s values, demonstrate in our behaviors His power to aid us daily, and more effectively share His love for others. Little wonder that human relationships become the battleground for demonstrating the level of Christian graces and self-control. After all, Jesus himself said: “By this all men will know that you are my disciples if you love one another” (John 13:35). This entry was posted in Faith, Inspiration and tagged fruit of the spirit, self-control. Bookmark the permalink. Great post and it spoke to me as I read a post on a father killing his infant son for his teenage girlfriend. The other thing that spoke to me was on the fact that we have no control over our children and certainly not when they are grown and want their own life distances themselves from one. I know God gives us all free will and some answers we’ll get in heaven. Thank you Emma. My daughter suffers from mental illness and I have had to learn to let go and let God. This is a daily exercise for me. Truth be told, I want a different life for her but it is HER life and her choices. I have done all I can to lead her on a path I think would be best but in the end all I can do is love her. Thank you for reading and I hope you like more of my musings in the future. I will be sure to read your blog as well. Yes, you are right. All when can do is love them. My daughter gets the same way and praying for her healing.